This little sandwich shop is a favorite of local stoners (that's what we've heard, anyway) because of the laid-back vibes and disturbingly dank sandwiches. Oh, and did we mention the cups of nacho cheese sauce you can order with the fries? Nothing about this place necessarily looks appealing, but one bite and you’re in heaven. Just try to remember that they’re closed Sundays. Everybody needs a day off, man. Once reserved for the few people that live that deep into Northeast Portland, Grant’s recently opened up a new location on NW 23rd and is serving its full menu six days a week. (Closed on Saturdays). 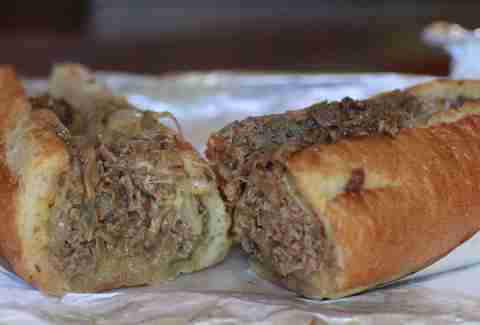 They ship buns and peppers in from Philadelphia, and most certainly have cheese wiz on hand, which means they make one of the most authentic cheesesteaks in town. 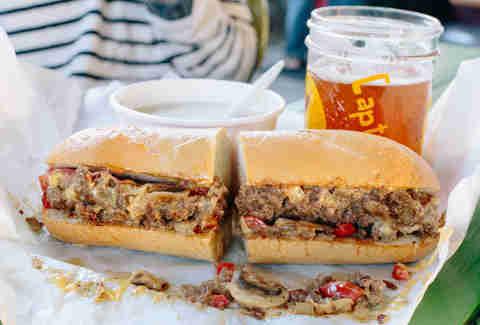 Sure, it helps that it’s located in one of our favorite boozy food cart pods and sells some of the best clam chowdah in town, but the real secret to this cart the cheesesteak. 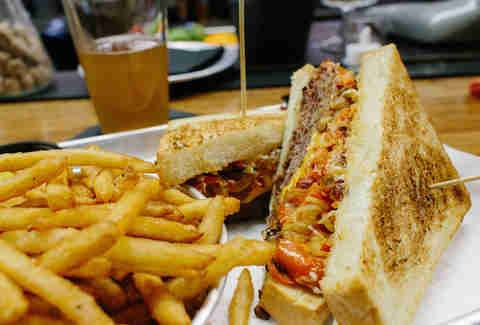 Order one with tha works (sweet and spicy peppahs, American cheese and wiz, mushrooms) and let the Bostonian do his thing. Just be careful not to engage in any sports talk. 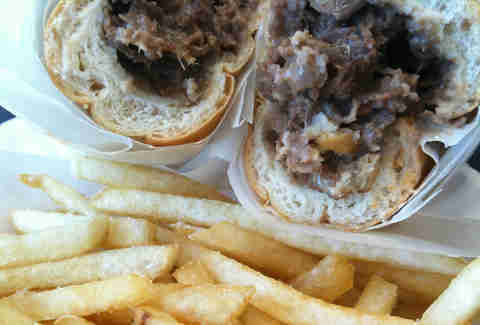 The only real non-traditional cheesesteak on the list, TILT eschews the soft roll for toasted bread and shaved sirloin for a smoked brisket. However, in a move that should surprise no one, they stay true to the classic by loading it up with onions, peppers,and enough melted American cheese and mayo to make you wanna ask for a fork. But don’t be a wuss! Just ask for extra napkins instead. Ben has been serving up... um, cheesesteaks and burgers, for a long time. This is apparent upon first visit when everyone in line is not only chatting with him, but also with each other. The almost cult-like following may seem strange to an outsider, but you'll soon understand. One simple menu with one friendly cook who's serving delicious hot sandwiches Monday-Friday. We’ll see you in line. Formerly Philadelphia’s Steaks and Hoagies, 13 Virtues recently rebranded to focus on its brewery. 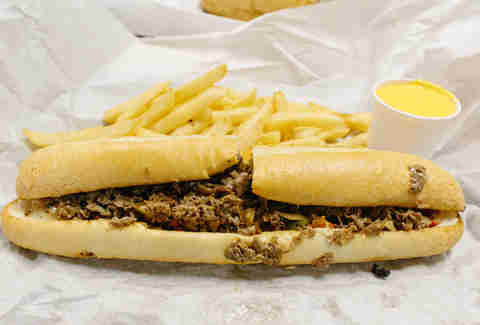 But don’t worry, the East Coast deli, with multiple hoagie offerings, remains a key component to its business. Case in point? 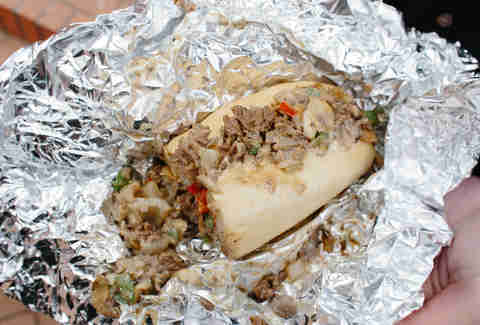 This cheesesteak/hoagie hybrid loaded up with sweet and hot peppers, lettuce, tomatoes, onions, and a drizzle of oil and vinegar. Check 'em out on Monday nights between 5:30-9pm for half-priced cheesesteaks, and then stick around after 9pm for $2 pints of craft brews. 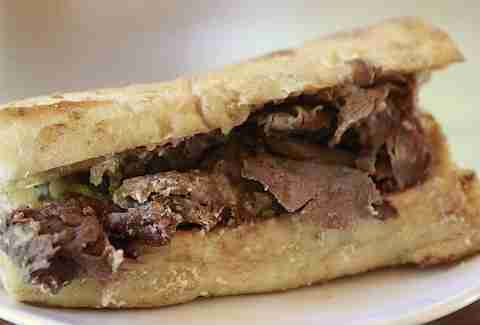 They sell out almost daily (probably because they sell their cart-made pastrami and bacon by the pound), but if you get there early enough there should be enough steak to grab the Broad Street Bully, an homage to their roots. 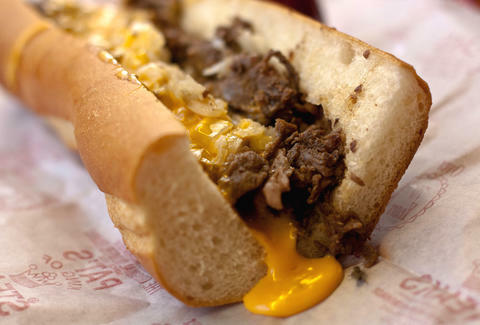 They let you choose between whiz and sharp provolone, and onions or nah, but trust me, you want it loaded. Every once in a while there’s a place so good we have to recommend you take the I-5 up to the Couv. This is one such spot. 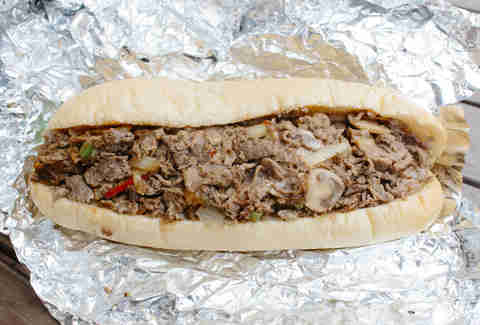 Philly Bilmos is a no frills, blue collar deli located in a no frills, blue collar neighborhood. And the sandwich? Tons of meat, tons of cheese, and just the right amount of peppers and onions. Go ahead and order two so you don’t have to drive back when you get a craving the following day. 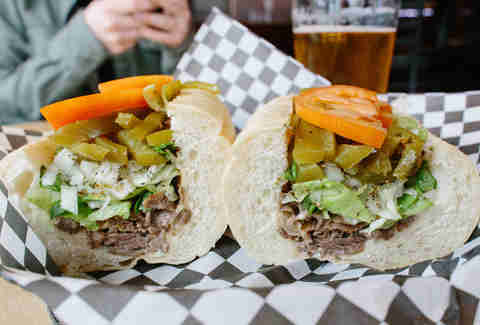 We’ve already declared their Broadstreet Bomber one of the best Philly’s outside Philly, so you shouldn’t be surprised to see this on the list. Starting with half a pound of meat doesn’t hurt either. And don’t try to make small talk with anyone or take your time ordering. Just shut up and eat! This cart used to used to rub shoulders with other sandwich-slingers in Pioneer Square before moving to friendlier turf next to the offices of Big Pink. And it’s a good thing too, because instead of getting in line with lackadaisical tourists you queue up with businessmen on lunch break who somehow find a way to always be in a hurry. These steaks come in three sizes, but c’mon Goldilocks, there’s really only one you should order: the medium.